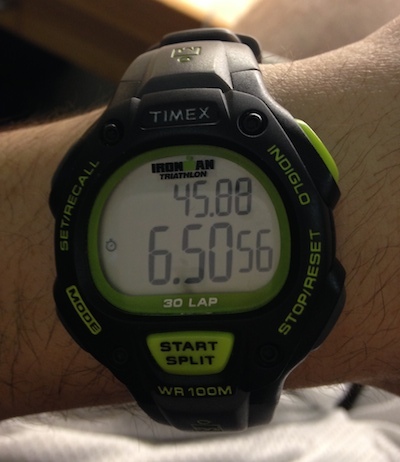 New PR for the mile: 6′ 51″. And on Marathon Monday too! Maybe I’m not so bad at this running thing after all. Feels great to be in the “6 minute club.” Definitely a lifetime record. I was kind of ticked off after my bad bike ride yesterday, so I told myself I was going to set a PR this time. In recent runs where I had run the mile in around 7′ 20″ or so, I felt like I could have gone a little faster, so it seemed reasonable that I could break my 7′ 11″ record. I ran the first few laps quite fast — faster than the required pace. Even though I was getting out of breath as usual, I realized that all that pain would be wasted if I didn’t continue pushing to get a record. Obviously some of my previous workouts have paid off… I basically used my idea that “if you’re not wheezing, you can keep going” and kept myself running just slow enough to not start wheezing. Because of my previous workouts, this turned out to be roughly on pace.